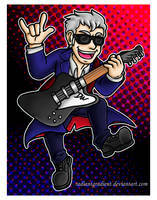 We know that from "The Doctor Dances"
Yeah ^^ Nine was a great Doctor, shame he didn't stay longer. This Reader insert was requested by MagicDoughnuts. Enjoy and thanks for requesting. So this idea came to me (Funny enough) when I was eating Ice Cream while walking around the mall. I decided to put this as a Reader Insert idea so here it is. The Doctor, Peri and you were walking around the town, taking a break from your normal adventures for now. Peri wanted to show you the stores around the area and go shopping. The Doctor wasn't to keen on the idea. He would rather be doing more useful things with his time besides this, yet he went along with it all for you. You and Peri continued walking around as you spotted an ice cream stand. Ice cream sounded very delicious to you at the moment so you looked to Peri and the Doctor "Can we get some Ice cream?" Peri looked to the Doctor wondering the same thing to. She doubted he would be up for it but with you, he would probably give in.